The American 8th Air Force saved the English from being invaded and defeated by Germany during World War II, according to Wes Belleson, who served as a tail gunner in a B-24 “Liberator” flying from a field near Norwich, England during the Second World War. In 1941, after the United States was drawn into the war, Belleson had just graduated from high school and was starting his freshman year at the University of Minnesota. “Come fall of ’42 I said the heck with education, my country needs me more. I joined the Army Air Corps,” he said. “A few days later I found myself on a troop train headed for Salt Lake City, Utah where I took basic training. “After basic I was shipped to Kendall Field in North Florida for training as an armorer on a heavy bomber. 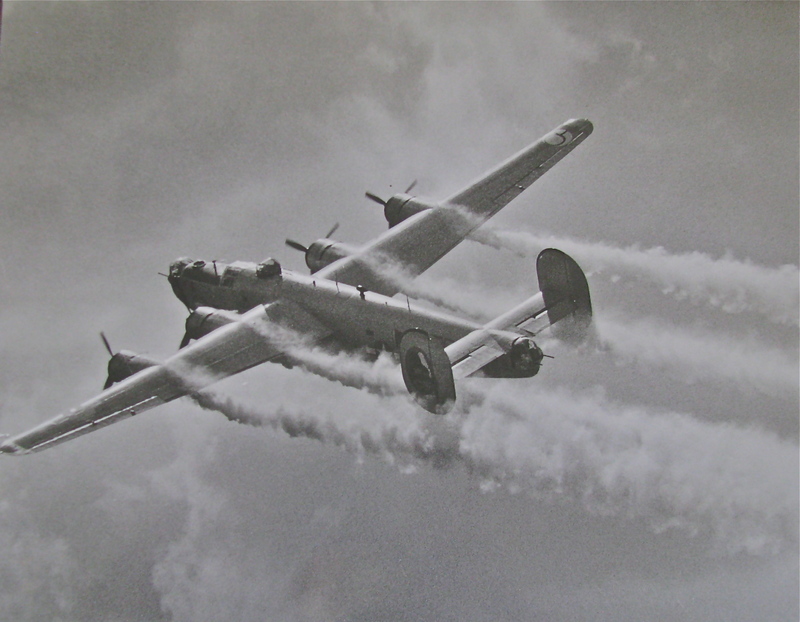 We started off at Kendall flying gunnery practice over the Gulf in a B-24. We’d shoot at towed sleeves with colored bullets so we could see who hit the target. “After gunnery school I was shipped to Boise, Idaho where our B-24 crew was formed up. Our crew, the other nine guys and me, were going to be living together, eating together and doing everything together all at the same time,” Belleson recalled. The crew of “Princess Pat,” their “Liberator,” arrived in Wales in the spring of 1944 and flew out of Horsham Air Base near St. Fair, England. They were close to Norwich. 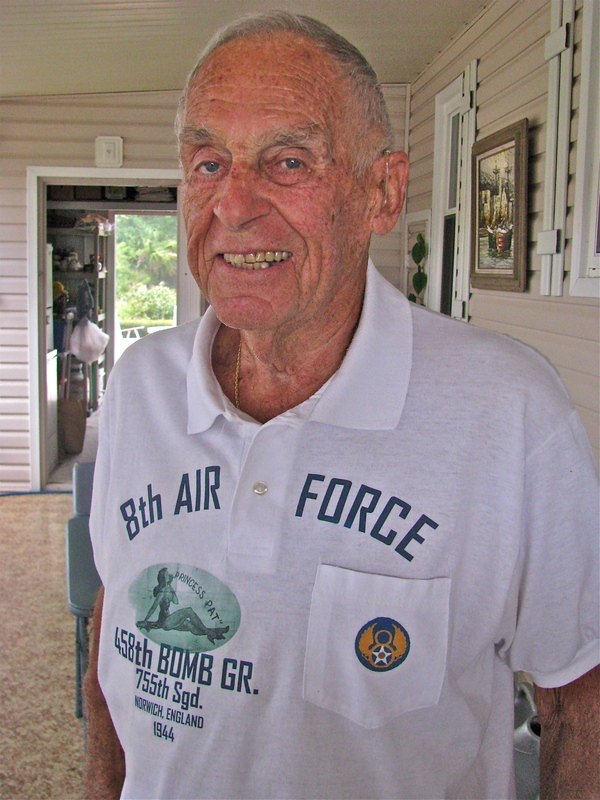 “We joined the 458th Bomb Group, 755th Squadron, 8th Air Force. We lived in what had been a base for Royal Air Force officers. We had apartments with fireplaces. We lived like kings. “Our first mission was to Frankfort, Germany on March 2, 1944. We probably had 100 or more bombers on that flight. A polka-dotted bomber was our leader’s ship and the one we formed up on. It circled the field for an hour or more as we formed into groups and headed for France. “Our biggest fear was from flak. The Germans would send up a fighter to determine our altitude and after it radioed the altitude down to the guns on the ground we’d start getting hit. “German fighters mostly stayed away from the bomber formation out on the horizon. With 100 bombers each with 10, .50-caliber machine-guns the fighters wanted nothing to do with us,” he said. What Belleson remembers most about his first mission was their lack of machine-guns. “Before we made our first mission we were given a lesson on how to clean our guns in our airplane. They forgot to tell us not to oil them,” he said. “We were out over the Channel and decided to test our guns. Normally we’d warm them up by shooting a few rounds before we hit the French coast and the enemy. “Because I was the armorer I had to climb out of my tail turret, walk through the bomb bay and go up to the twin .50s in the nose. It was my job to try and get the machine-guns going,” Belleson said. “I took my gloves off, got out where the guns were and tried to charge them. It was so cold I thought my hands were going to fall off. It became obvious to those aboard “Princess Pat” that attack from German fighters was dissipating. “Liberator” crews didn’t face the onslaught from ME-109s and Focke-Wulf-190s that the B-17, “Flying Fortress,” crews had to deal with in 1943 when they arrived in England. Berlin was their worst combat mission, he said. Although hundreds of planes flew these missions the German anti-aircraft flak was horrendous and deadly. On that score Belleson and the other members of the crew were lucky. 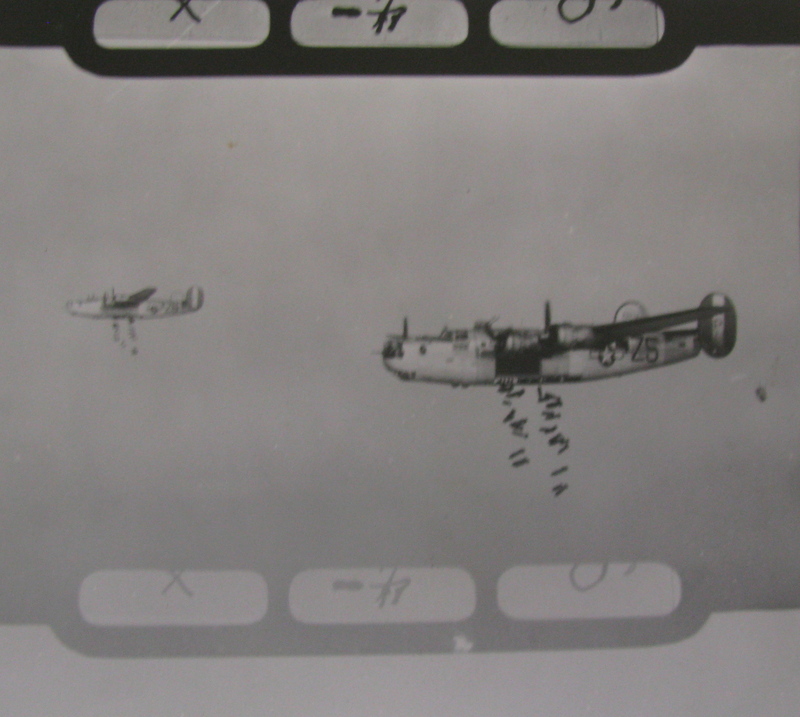 No one was wounded by enemy fire even though their bomber sustained severe flak damage on some of their missions, including the flights the made to the German capital. “I bet there were only two or three missions out of the 33 we flew that we were able to see the ground. In Europe it was always rainy, cloudy or foggy. We could’t see anything most of the time,” he said. On their last three combat missions the crew of “Princess Pat” took part in the D-Day Invasion, June 6, 1944. “Before D-Day, on our return trips to England from our missions, we’d fly over air fields and every field would be full of tanks and trucks collected for the coming invasion. It was astronomical the numbers of tanks and trucks that were stored,” Belleson said. “On D-Day we were up very early in the morning. Our mission was to drop bombs all along the coast before Allied forces hit the beaches of Normandy. We bombed low at 10,000 or 15,000 feet. We had plane after plane saturating the enemy coast with bombs. We’d take off with our bombs, fly back and load up again. We just kept coming and going. “We were up high enough that I could take a pretty good look around the English Channel. All I could think about were those poor devils down there who had to wade ashore and face the Germans who were waiting for them,” he said 70 years later. After the war the former B-24 tail gunner went in the grocery business with his father in Minneapolis. His dad had owned a mom and pop grocery before Wes went to war in the 1940s. “My dad started having union troubles in the grocery business after the war. We decided to sell out and go in the men’s clothing business in Edina, a nice suburb of Minneapolis in 1948,” he recalled. “After my father’s death a few years later from a heart attack, I took over and ran “Belleson’s Men’s Store” until 1975. He and his second wife moved to Florida several years later. She died a few years ago and he married for a third time. “I ended up with a third wife down here in Florida. They were all angels,” the old airman said with a smile. He has two children: Leslie and Jim. This story was first published in the Charlotte Sun newspaper, Port Charlotte, Fla. on Wednesday, April 17, 2013 and is republished with permission. Click here to view Belleson’s collection in the Library of Congress Veterans History Project. Wesley “Wes” Belleson passed away in Venice, FL on April 12, 2015 at the age of 92. He was born in Jewell, Iowa on April 8, 1923. His family moved and settled in Minneapolis, Minnesota. Wes graduated from West High School in 1941. He attended one semester at the University of Minnesota. In 1942 he enlisted in the Army Air Corps at Fort Snelling. His training began at Lowry Field, Denver, Colorado where he was entered in the armament section and became a tail gunner on a B-24 heavy bomber. He was assigned to the 458th bomb group stationed at Horsham St. Faith Air Field outside of Norwich, Norfolk, England. He completed 30 missions over Europe. His last mission was completed on D-Day invasion. 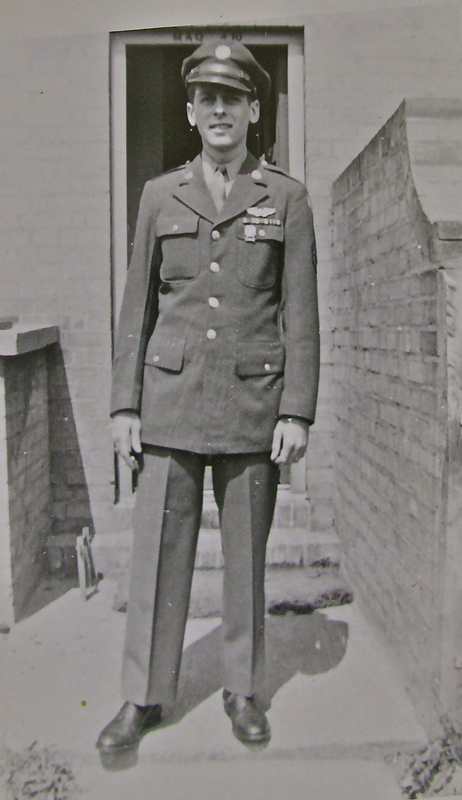 He was awarded the Air Medal with cluster and the Distinguished Flying Cross. He was discharged in the fall of 1945. In 1948, he and his father Lars founded Belleson’s Men’s Clothing store in Edina. When his father passed away in 1956, Wes became sole owner. He continued with the store until retiring in 1975 when he moved to his vacation home in Akeley, MN, and later moved to Venice, FL, where he lived out the remainder of his years. His first wife Laverne, passed away in 1961 of cancer. His second wife Marjorie, passed away in 1999 of cancer. He is survived by his wife Heidi, of Venice, FL; daughter Leslie Ascheman (Dean) of Rosemount, MN, and son Jim (Donna) of Lewisburg, PA, several grandchildren and great-grandchildren in addition to his dog, Minnie. Interesting story but the Battle of Britain was a team effort! Yes, kenjara, indeed a team effort, yet all these stories on this website is from the perspective of the veteran, in his or her words. Yeah, and it barely involved any Americans…7 at last count. Whilst I am very thankful to Wesleys’ brave contribution to fighting in Europe. His memories of his personal experiences are of value. However he does not have a good perspective on the USA’s role in the war. However to be fair it is a view which is common in US media and always has been. The battle of Britain (the first battle to be fought almost entirely in the air) was over by Oct 1940. By the end of 1940 Britain was outproducing the entire Nazis continent in fighters and bombers, and had total dominance of the air during daylight. The USA didn’t even join the war until over a year later. By which time the Brits were already carrying out massive bombing raids on Germany. The Nazis didn’t attack again during the day because they would have suffered heavy losses. There were some phases of night time raids which occurred after 1940. They were a big problem, but by themselves were not a serious military threat. The US arrived to see the tail end of the night raids, but couldn’t help with night fighting, becuase it was not equipped to do so. Repeated requests for night-fighter Mosquitoes were not met, as the Brits couldn’t spare them. 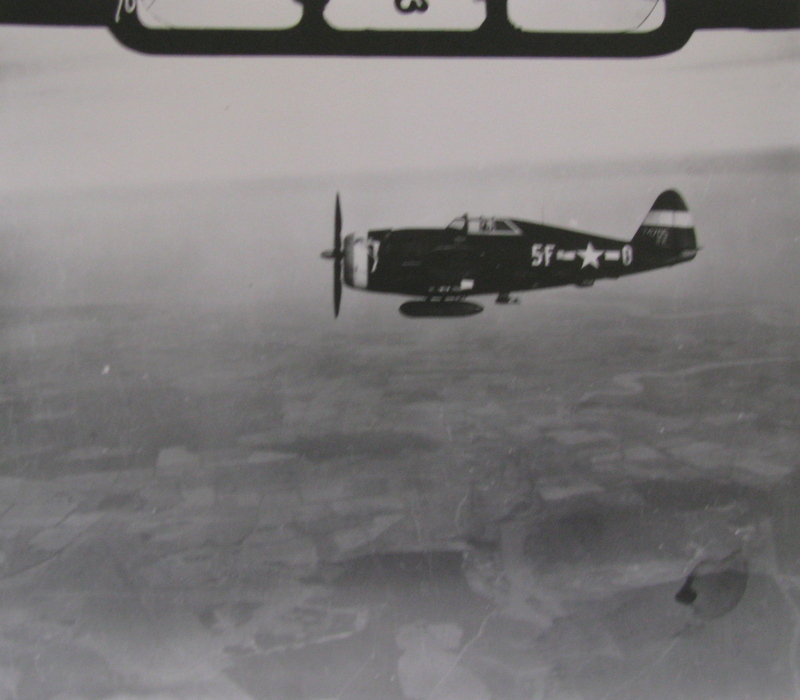 The US night-fighter P38’s and others, which were supposed to do the job, turned out to be of no use over Britain. (night raids would be usually be carried out through thick cloud cover, which was sometimes miles deep.) Through they did achieve a small number of kills later in the war, mostly ancient JU88’s which they could catch. Militarily the US helped but most certainly did not save the British. There is a very big difference. Don’t think we are not grateful, for we are. The war would have dragged on for more years and much of Europe would have fallen to Russia without US help. This “we saved you” attitude also applies to many other areas of conflict during WW2. For example only about 1/5th of those taking part in the D day landings were US troops, most were British, the plans for it were drawn up by British. (Unfortunately the US Generals chose not to use, or to misuse specialist British equipment offered to them which could have saved many US lives). For those younger among you; please don’t learn history or get your historical perspectives from Hollywood or fox news. It results in an ignorance and arrogance which does not fit with an otherwise wonderful people, and is not becoming of you. You can’t be serious! Fox News a history source? The worse thing a young person could do these days is to tune into CNN or MSNBC, where Party doctrine rules. C-SPAN is the best history source on TV. Not even the History Channel today is reliable. How many of today’s liberals know the GOP gave us the Civil Rights Act of ’64 and the Voting Rights Act of ’65. Look it up, it’s all in the record. the B 24 was in Venice, Fl on February and I am so happy to bought him a flight and everybody was helping him in- and out and he was talking for the last weeks of his life…………………. Goodness knows if you will receive this message but if you do please do reply to me. My name is Jean Wills and I am producing a commemorative booklet about the 458th Bomb Group at Horsham St Faiths in WWII, I think that Wes was stationed here. It is of interest to me for to make contact with you also as I had an American uncle who was stationed here in the UK in the war. I know Venice, FL very well as my aunt lived in Englewood for many years, which is not far as you know. Anyway my details are below if you would like to contact me. I took the liberty of making corrections/editing Jean’s comment for clarity. Interesting, my dad Lewis Roberts flew in “Princess Pat”, after D-Day until he had 35 missions with the 458th.